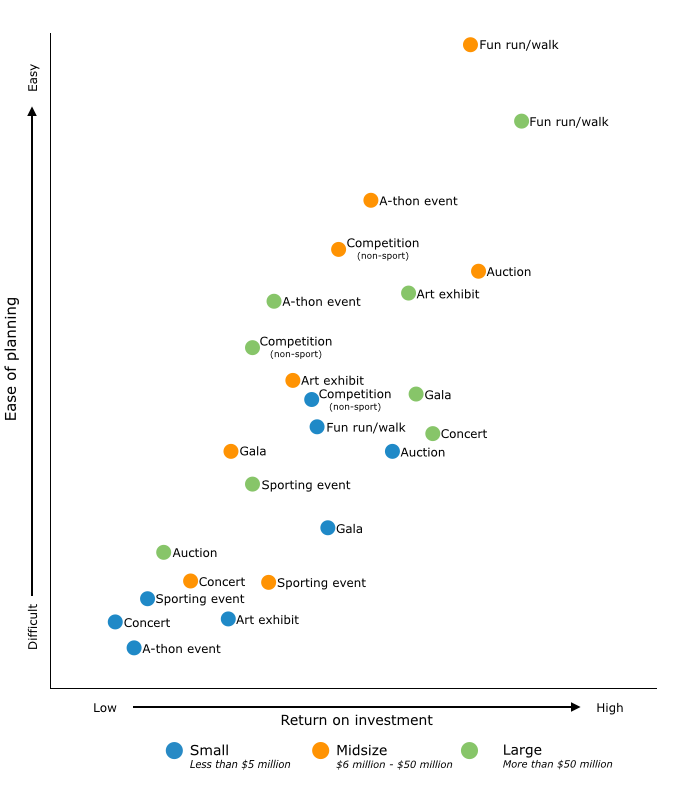 Which Type of Fundraising Event Is Best for Your Nonprofit? Eighty two percent of nonprofits host fundraising events such as galas, golf tournaments, and competitive races to secure contributions and raise awareness for causes, according to the research group Nonprofit Research Collaborative. Fundraising events can generate significant revenue for social impact organizations, but they often require more time to plan and market, and higher upfront costs than non-event fundraising endeavors. Fun runs and walks do not include marathons, half-marathons, 5Ks or other high-profile races. Fun runs in this research were defined as runs and walks that do not require special permits or road closures, for example, an event that uses a community hiking trail. Overall, data indicates that fun runs and walks are the easiest to plan and deliver a high return on investment for organizations of all sizes. This is especially true for midsize and large nonprofits with an annual operating budget of $6 million or more. Fun runs are not as easy for smaller organizations to put together and do not deliver as high a return, however, they are still a good choice for nonprofits with lower operating budgets. Dollar for dollar, a-thon events incur the fewest costs, which makes them a good option for most nonprofits with small budgets looking to get the most bang for their buck. Large and mid-size nonprofit organizations also see a good return on investment, seeing results that yield low cost per dollars raised. Instill a sense of competitiveness among your supporters by organizing a competition such as eating, singing, or dancing. Members of the public pay to participate in voting or in the competition itself to raise funds for your cause. Local laws can sometimes hinder a competition, so make sure your competition is legal before you spend time planning it. Non-sports competitions are another type of event that incurs fewer costs for nonprofit organizations of all sizes. This holds especially true for smaller nonprofit organizations, where Software Advice’s research shows non-sports competitions are the easiest type of event to plan with the greatest return on investment. One of the most effective ways to bolster the scope of your event, attract more potential donors, and get supporters to spend more money at an event is by incorporating a live or silent auction. An auction fundraising event not only gives your guests a reason to open their wallets, it also gives them something to do while socializing. It also gives your employees something to talk to your guests about during the meet and greets. Discussing items to be auctioned off gives you an easy tie-in to the fundraising component of the event without having to ask for a direct donation in person. Auctions yield high returns on investment for midsize organizations and are easier to plan. For small organizations the return on investment is relatively good but requires more planning. For larger organizations planning auctions are difficult to plan with little return on investment. A charity art show is an opportunity for members of your community to display their talents for a great cause. There are several ways to host an art exhibit. One way is to hold the exhibit as a contest, where local artists showcase their work for a small entry fee in order to be professionally judged, with donated prizes for winners in various categories. Another way is to find artists who are willing to show their work in the interest of selling it for your benefit, giving a percentage of the sale to your organization. Art exhibits are good events for large and midsize organizations to host. Plus, they are relatively easy to plan. Art exhibits are more difficult for smaller organizations to plan with little return on investment. A nonprofit gala is a large-scale fundraising event that usually includes dinner, dancing, entertainment, and silent auctions or raffles to benefit a cause. Because this is typically the biggest event a nonprofit will hold, it requires many resources to pull together. While ticket sales go toward fundraising efforts, most galas also sell sponsorships or corporate tables, or hold a silent auction where, if most of the items are donated, you can have a much higher profit. Galas can be expensive to host when taking into consideration food and beverage (including caterers, waiters, and bartenders), rental fees for the location of the event, and marketing. Other major costs may include transportation, security, parking, and hotel fees for V.I.P. guests. Due to the large upfront costs, galas are most beneficial for large nonprofit organizations. Small and midsize organizations can also benefit from hosting a gala, however, this requires more planning and they usually see a lower return on investment. The average cost per dollar raised by galas is also much higher than other event types such as an a-thon or art exhibition. Benefit concerts aren’t just the celebrity performer-packed events you see on television. Concerts can also be smaller scale, featuring local talent. The benefit is that these performers are more accessible and likely to bring their family and circle of friends to the event. With fundraising software, you can also ask bands to set up team pages and fundraise in the weeks leading up to the show. This way, even their out of town supporters who cannot attend will have the opportunity to give. Concerts can be some of the most fun events to host once everything comes together, but they have a very high cost per dollar and substantial upfront costs, making them more suitable for large nonprofits with big budgets and experienced staff. These types of events are best suited for large organizations rather than small and midsize nonprofit organizations. Many sports teams work with nonprofits to assist with nontraditional fundraising at sporting events. Hot dogs, garlic fries, soda, and peanuts re arguably the four essentials of every sporting event. You can be a promoter of all four of these treats, plus get donations for your organization, all by working concession stands at a few of your local team’s football, baseball, and basketball games. Your organization gets a percentage of what you sell during the day. Sporting events encourage teamwork and allow for nonprofits to gain funds in an adrenaline-packed atmosphere. While sporting events are fun to participate in, they typically provide little return on investment for all size organizations. Additionally, the average cost per dollar earned in sporting events is only slightly above concerts but on par with gala events. The size of an organization typically determines the budget and type of event a nonprofit should host. Size and budget aside, however, fun runs and a-thon events prove to be best when it comes to ease of planning, affordability, and return on investment. Contrarily, concerts and sporting events tend to take more time to plan with a lower return on investment. No matter what type of event you decide to host, you should always track your data. The numbers will help you gauge the success of the event, improve attendance, and determine how to cut costs for future events. Consultant Kathryn Hall posted in npENGAGE that fundraisers should track, at the very least, the total amount of contributions raised, expenses, and the number of attendees for each event. For larger events with many moving parts, or for recurring events that an organization aims to improve on year over year, performance analysis is best managed through fundraising and event management software. The reporting tools and dashboards make it less stressful for nonprofits to analyze the performance of their events while also reducing the amount of hours spent doing administrative work. Simply put, the larger the event and the more staff and volunteers needed to manage it, the more software simplifies the process to ensure the event goes well. Use fundraising and event software to reduce staff workload by automating common tasks and aggregating data. Ask for monthly donations rather than just one-time donations. Plan inspiring events, ensuring attendees leave with an understanding of your organization’s mission and what they can do to help. “Events are usually transactional, rather than transformational—meaning they focus on entertainment to secure a one-time donation, instead of education, which turns guests into long-term supporters,” explains Katherine Wertheim, Certified Fund Raising Executive (CFRE), seasoned fundraiser, and principal at Werth-It Consulting.